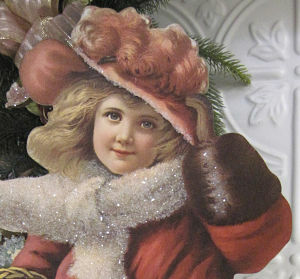 This girl is one of the loveliest depictions of the Victorian Era. She is wearing a red coat with dark fur trim and large light red hat with feathers. Must be a windy day as she uses her left hand to hold on her hat and her scarf is blown to the right. 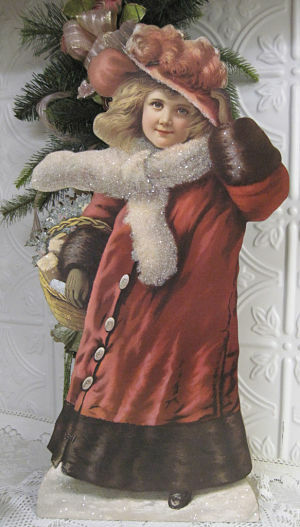 She is holding a basket of wrapped packages and holly. Crystal glitter covers the scarf, holly and snow. Beautiful winter piece for a table or mantle. Loveliest when placed where light can be reflected from the crystals. Back has a hinged stand that collapses for flat storage.